Microsoft just wrapped up its October event, and as we expected, it wasn’t wall-to-wall hardware announcements like last year. Nothing from Lumia land. Radio silence on the Band front. What Microsoft did announce for the coming months were a few incremental software and hardware updates as well as one big gadget bombshell. 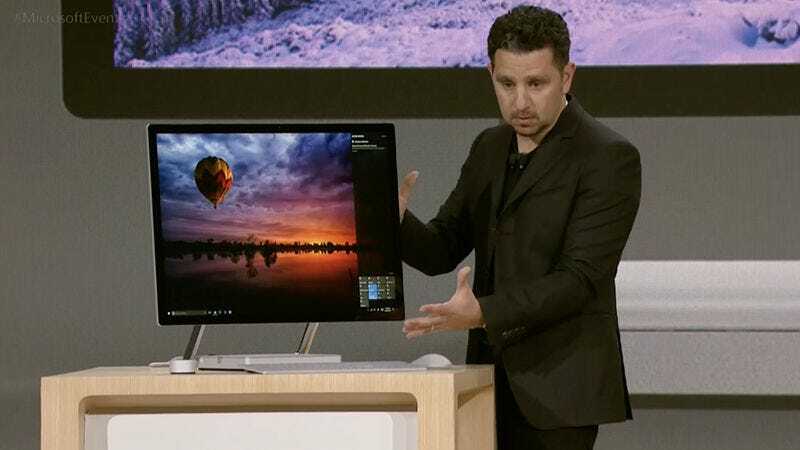 Microsoft’s new, massive convertible desktop machine looks like the future. It has a massive 28-inch touch display that’s only 12.5 millimeters thick and flips between color spaces on the fly. The entire screen folds down for ease of use with a pen and with Microsoft’s new dial peripheral. According to the Microsoft site, options include an i5 or i7 core processor, up to 32 gigs of RAM, and up to 4GB NVidia GeForce GPU. Prices start at—wait for it—$3,000. Last year’s big surprise was Microsoft’s first ever laptop: the Surface Book. The clamshell hinge and 2-in-1 design made it a popular option, and now it’s getting a big boost. The upgraded Book comes with twice the processing power and a whopping 16 hours of battery life, at a cool $2,400. The Creators Update is coming to Windows 10 in early 2017 (for free), and it’s packed with meaningful new features. MS Paint is getting a big, 3D overhaul, and PowerPoint will add 3D modeling, and 3D scanning is coming for Windows phones. Beam broadcasting will be immediately accessible within Xbox Live. SMS, Skype, and a few other chat apps will get folded into one big chimeric messaging center. It’s gonna be a big one. 3D capabilities are being added onto much-beloved Windows apps as Microsoft pushes consumers into “mixed reality.” Modeling 3D objects in Paint and then viewing them in 3D, of course, requires additional hardware. And that hardware doesn’t come cheap. But now HP, Dell, Lenovo, Asus, and Acer are working with Microsoft to create headsets for the thrifty, starting at $300, that don’t need additional accessories (or phones) to function. It’s the part of Microsoft’s plan we know the least about, but in a way that’s what makes it the most exciting.